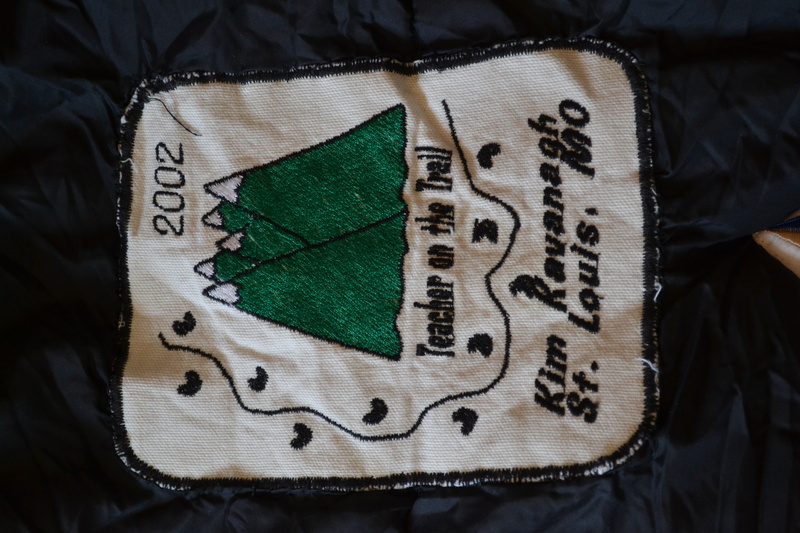 One of the traditions of the Teacher on the Trail™ is the passing of the official sleeping bag from one year’s teacher to the next. 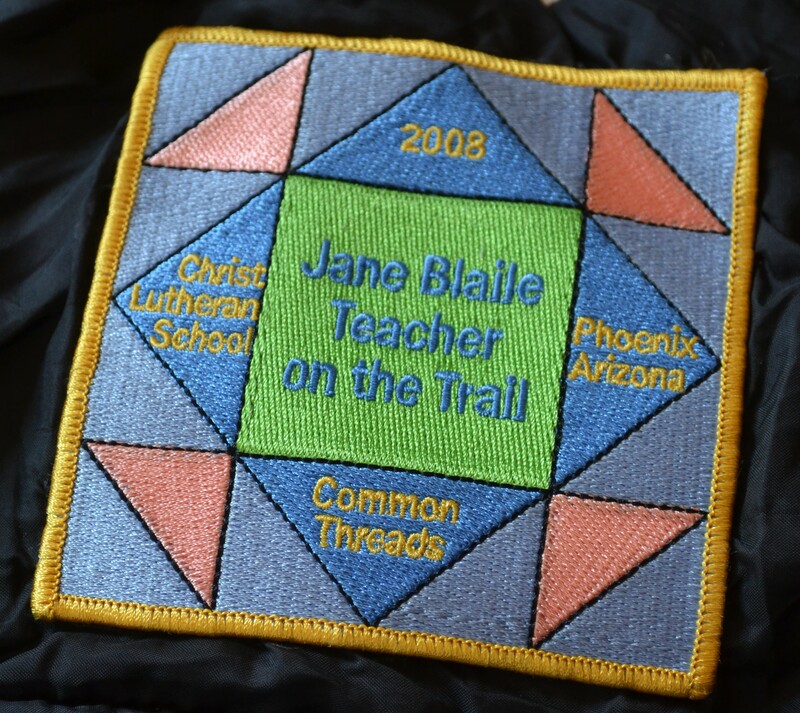 Each teacher adds his or her own patch to the sleeping bag and then carries it on the trail during their trip of a lifetime. Each patch is as unique and special as the teacher who created it. Here are the stories behind some of the patches! The first Teacher on the Trail, Andrea Aufder Heyde (known as Finney), actually had to buy her own sleeping bag which she then got to keep! She says it is one of the highlights of her school presentations to this day. Kids love to climb into her sleeping bag which has been at every checkpoint on the Southern Route except for three. Finney designed her patch in her happy, favorite color: yellow. It has a husky head on one side and a cardinal on the other. The cardinal is the state bird of her home state of Indiana. 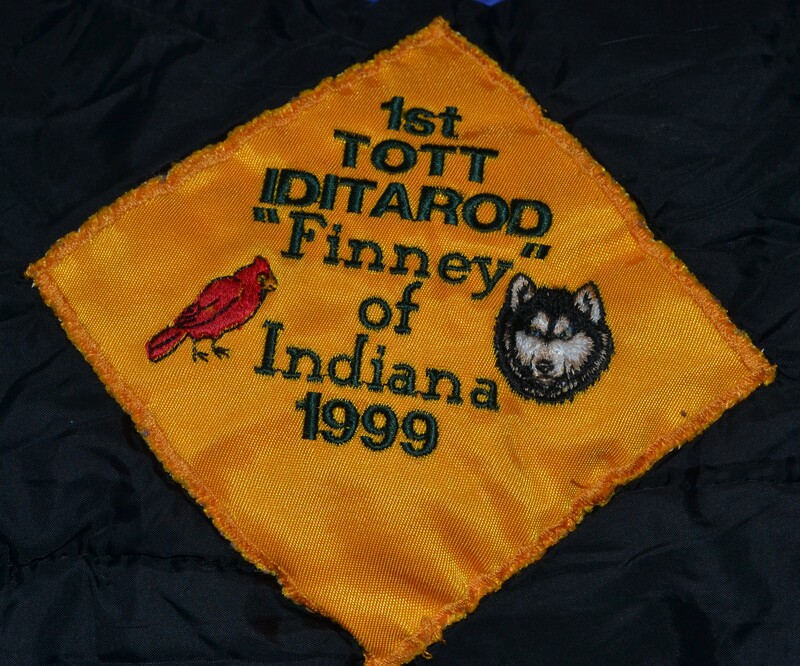 Her patch reads “1st TOTT, Iditarod, ‘Finney’, of Indiana, 1999.” She has a second patch on her big Trans- Alaskan suit, which the kids also love to put on when she does presentations! 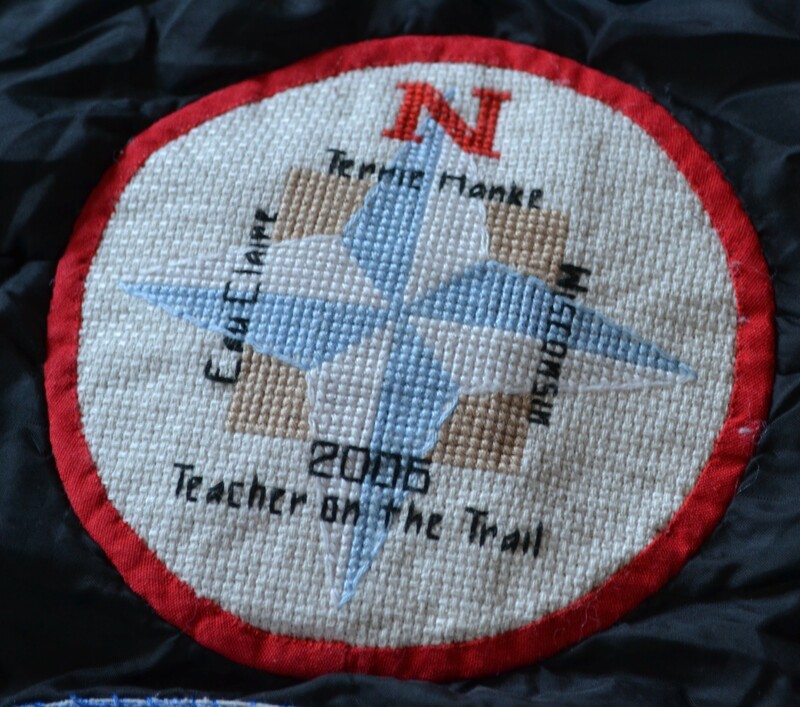 When the Iditarod Trail Committee decided to provide the official sleeping bag, it was Diane Johnson‘s idea that each teacher should add their patch. 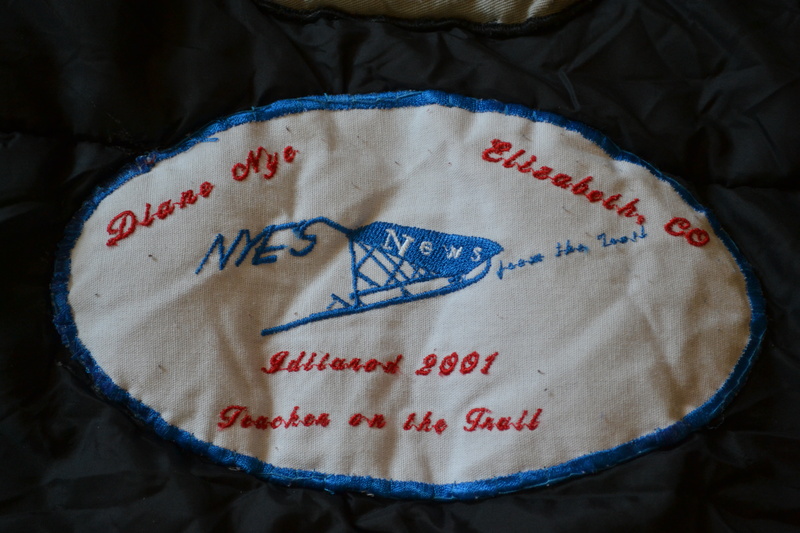 My last name is Nye and my weekly bulletin to my students’ parents was called “Nye’s News.” When I was named the Teacher on the Trail and learned that Finney and Diane Johnson both had patches on the sleeping bag, I knew I had to come up with a patch too. I worked with a graphic artist, who headed up my fundraising committee and was a former parent of one of my students, to use the “Nye’s News” concept to create “Nye’s News from the Trail” into a sled. The word Nye’s was near the handlebar of the sled with the “S” forming the handlebar. The word “News” was in the sled bag and the “from the Trail” made up the trail in front of the sled. The design of the rest of the patch had my name, year, and the school I was at – Running Creek Elementary School in Elizabeth, Colorado. The base color was white like snow; the outline was in blue and lettering in blue and red which were the colors of the Iditarod logo and signs at the time. 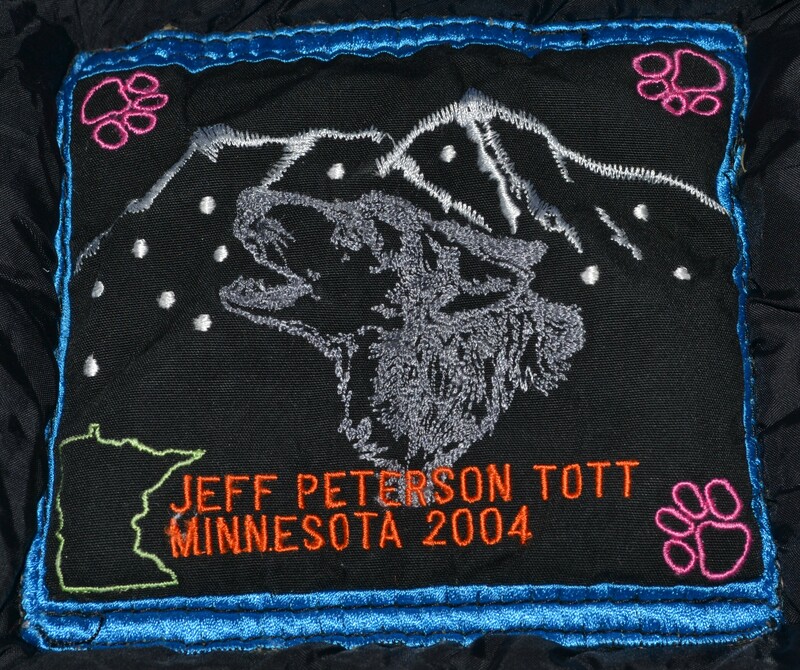 The patch for Jeff Peterson, 2004 Teacher on the Trail™, was the result of a school wide contest run through his art specialist. Jeff reports that the contest was a great way to bring the school together for his adventure on the trail! The art teacher selected one patch from each of the school’s 22 classrooms and each teacher was then given a sticky note to place under the patch that they felt best represented this experience (just the way Alaskan officials selected the Alaskan State flag with Bennie Benson being selected the winner). A 4thgrade girl’s picture was selected and made into the TOTT patch for his year. “In the floor of the commons entryway of North High School in Eau Claire where I teach is a Mariner’s Compass. As a symbol of guidance and direction, it’s not surprising to have the elaborate decoration greeting all who enter the school. Seeing the compass multiple times each day, I knew it had to be the theme for my patch. The faculty and staff at North High School were wonderfully excited about the 2006 race but there was one person in particular who added a ton of energy to making the race really come alive in my school, Arlene Rasmussen. As the principal’s secretary, Arlene had her finger on the pulse of the school and she was a good friend of mine. One day we were talking and I mentioned that the “patch” for the sleeping bag was really stressing me out and with everything else I had to do, I didn’t know how I was going to design one and have it produced. One of my “big ideas” for being TOTT was to connect the people of Alaska to people from all over the world. The idea of a quilt came to me because a quilt is made of many pieces of materials that come from many different places, but work together for one purpose. So, I likened that to people that are different from each other being connected by commonalities. “A Common Thread” quilt project was my call for classrooms/teachers to share their culture with the Alaskan people WITHOUT asking for anything in return. The quilts were purely gifts, with no return expectations. It was very exciting to arrive in a town or village and find the quilt I had arranged for them to receive hanging on the school walls. It was very popular. So much, in fact, that I had more quilts than schools on the race route and had to extend the project to other parts of Alaska. 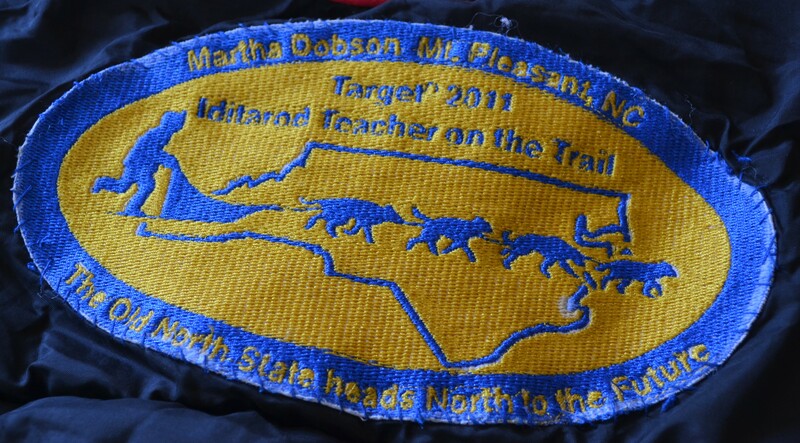 Martha Dobson, 2011 Target Iditarod Teacher on the Trail™, says her patch is full of significance. It’s blue and gold because those are the school colors for the school where she taught. And in her little town, those were the colors for the elementary, middle and high schools. North Carolina is on the patch because she is a lifelong North Carolinian. (Usually people who have always lived in one state call themselves native North Carolinians, Floridians, etc. but in AK, native Alaskans means belonging to one of the native cultures there and lifelong means not a native Alaskan but born and raised in Alaska.) The words The Old North State heads North to the Future tie NC’s nickname (the Old North State) to one of Alaska’s state mottoes, North to the Future. Martha thought it was a clever connection–it was literal in that she, from NC, was heading north–and the word NORTH made the connection, too, between the two states which are so far apart. 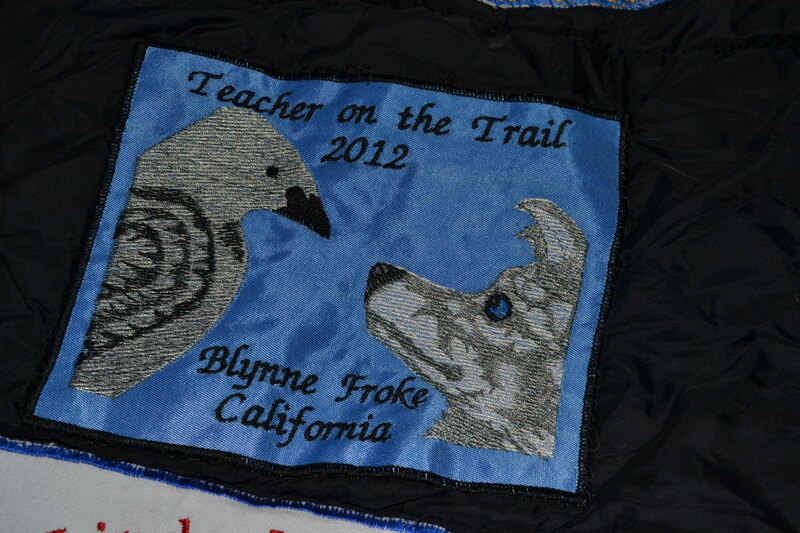 2012 Iditarod Teacher on the Trail Blynne Froke‘s patch is actually one of her own pieces of art! The same image appeared on the t-shirts for the Winter Conference for Educators in that same year. She describes it this way, “The raven in Tlingit culture is a very special character and has been a close companion for me for many years. In many cultures the raven is the “trickster” and that is the case also with the Tlingit, but he is also the messenger, the spreader of information from the gods to man. In that position, the raven can make deals and bring information to the other animals and man, he becomes a very creative teacher as he dispels power and learning to all the animals. On a more literal level, ravens are very inventive and common visitors in Alaska. They know that it is a good idea to follow dog teams as there is an abundance of food nearby. One summer that I spent in AK I kept having my windshield wipers pulled out and left on the hood of my van. Finally I was informed that it was a raven pulling them out and cleaning off all the dead bugs. . . . They are still working on the skill to put the blades back in.